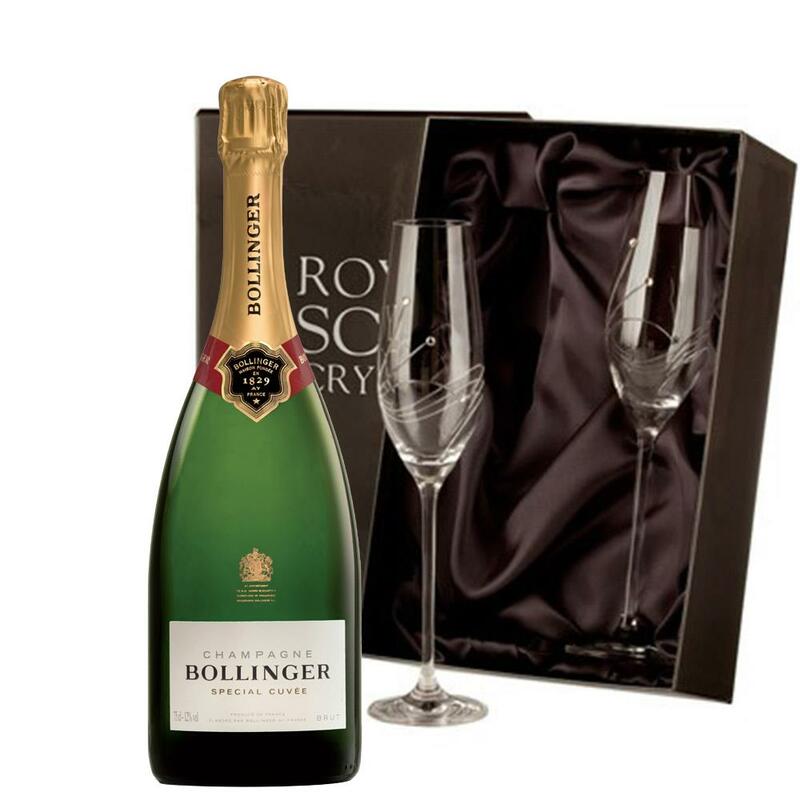 This set includes 2 x Beautiful gift boxed Swarovski Crystal Encrusted Champagne flutes and one Bottle of Bollinger Special Cuvee 75cl Champagne. Bollinger Special Cuvee Champagne, Extremely fresh with an intense lime -lemon flavored palate the bubbles give a creamy texture and the yeast autolysis adds another dimension. The Special Cuvée is the purest expression of the Bollinger style, of its craftsmanship and its singular conception of what champagne should be. It is therefore on this wine that the House of Bollinger shows how it is different from other Champagne Houses asserts its qualitative policy and by which it asks to be judged. Whether or not you particularly like the unmistakeable Bollinger style you have to respect it. Pinot noir (60 per cent) and pinot meunier (15 per cent) drive the wine augmented by fermentation in old oak barrels. The result is a complex spicy bready toasty baked apple bouquet the palate complete and round with an unexpected touch of delicacy and a pleasing dry finish. Send a bottle of Bollinger Cuvee for any occasion as its exceptional grape cant fail to please.